The 2012 hops harvest is complete! Everything is packaged and dried. The process is to first harvest the hops by hand picking. You can cut the vines down, but this year I decided to leave them up and use a small step ladder to reach the higher cones. My advice is to only harvest one variety at a time and keep track of where each variety is in the picking / drying / packing process. When they are dry, weigh them out for packaging. One of my recipes calls for 2 oz of Chinook, so I weighed out that amount for that particular bag. 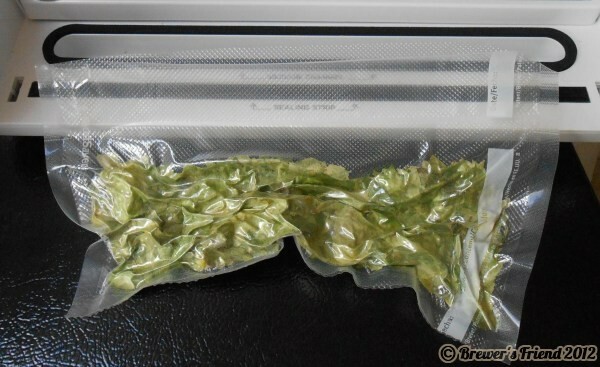 A vacuum sealer is a wonderful tool for this process. I then label the bag, and put them in the freezer. The inventory feature at the site helps me keep track of what I have. I wonder if I will ever get around to using that 2010 Willamette?? Here is the breakdown of what I got, and the order harvested in. It seems like Kent Goldings is always latest in the season to harvest. 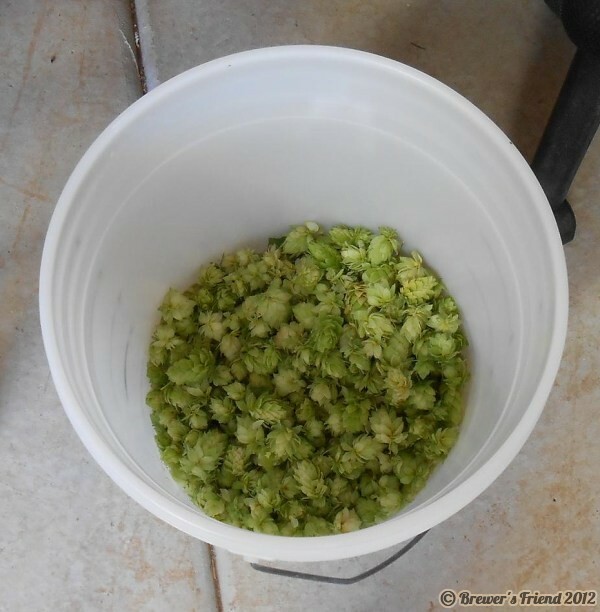 TOTAL: 42.5 oz = 2.65 pounds, @ $2.00 per ounce retail – about $85 dollars in hops, I’ll take it! You can beat the price of $2/oz if you buy in bulk. Why such small yields on some of these? I’m not totally sure… Here is what I observed. The Chinook plant is in the middle of the shed so it can grow the tallest (13.5 feet). Nugget has the second highest path to climb. The other plants top out around ten feet. Based on my extremely small sample size, it appears the taller you can let the vines climb, the higher the yield. Watering was very consistent this year thanks to our soaker hose setup. In terms of feeding the plants, this year I did only a couple treatments of miracle grow. Next year I will do more. I also plan to build a trellis on the shed to extend the reach of some of the vines. I’ve dried mine on window screens, similar to what it looks like you’ve got, with a fan underneath. I’ve found that after about 72 hours they lose 60%-75% of their water weight. So that’s closer to a 3x or 4x wet-to-dry ratio, where yours is more like 2x. But commercial hop growers actually kiln dry them at about 120°F. 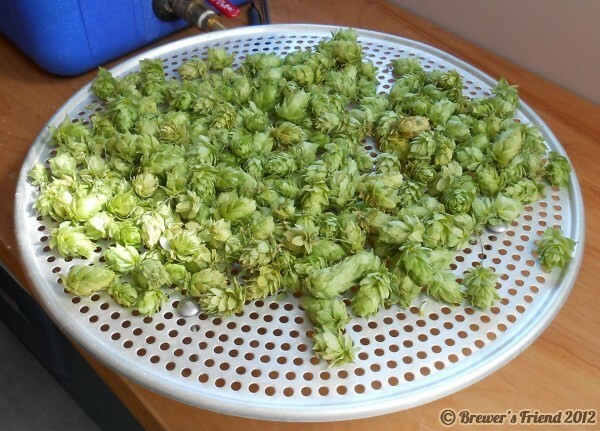 I bet if we had that equipment we’d see the cones lose 80% or more of their weight, which would truly make the ratio of wet hops from our bines to the pelletized hops at the LHBS 5:1. 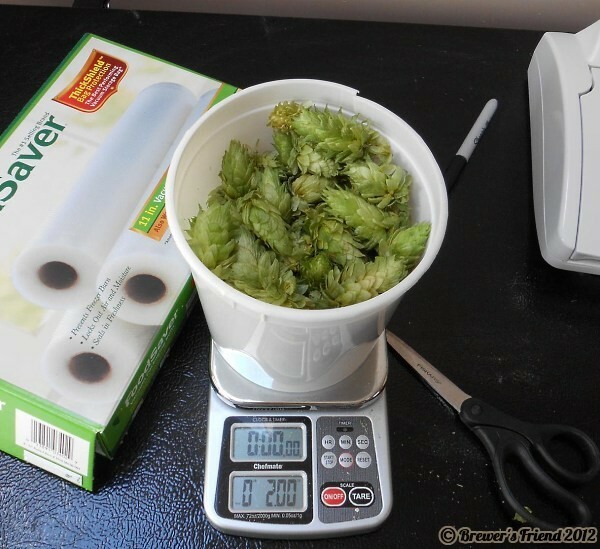 I guess the only way to know for sure would be to actually send a sample of your hops to a lab to test for AA% by weight. This year, they were starting to feel papery, and that is when I normally package. Besides I needed to make room to continue the drying process since I had so many varieties to process! 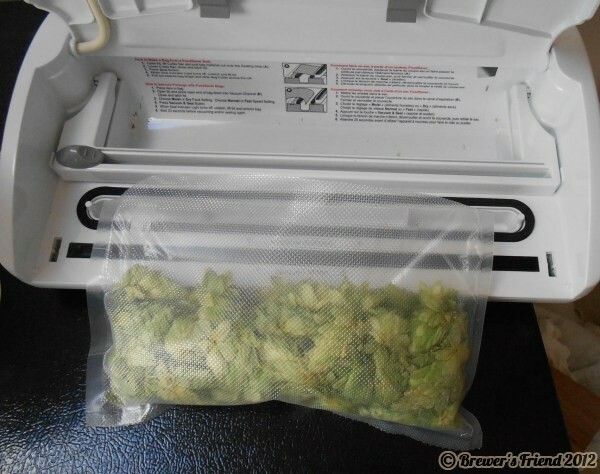 How do you know what the AA% is of hops you grow?? 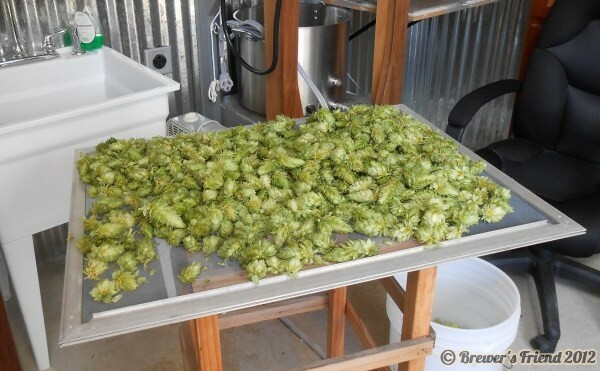 Is the strain pretty consistent, or is each hop season make a small change based on rainfall, temp, etc..
That is part of the fun of using your own hops – you don’t know for sure. Lab testing would be required to know for sure, but not worth it at this scale. I just use the variety’s average AA. I was wondering if anyone had used a food dehydrator and what the results they got with it?